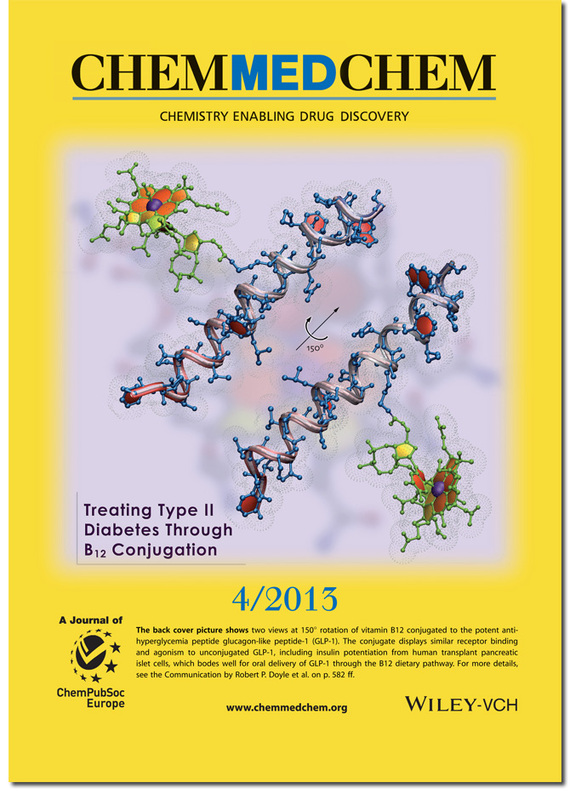 #50, published in ChemMedChem (11 (2016), 9, 1015-1020), DOI:cmdc.201600073. The key to molecular dynamics simulations is recycling – specifically, going into a first project with enough organization to know how to use everything in the next study. While that first successful connectivity table, parameter assignment, and RESP charge generation for something as Frankenstein-esque as vitamin B12 is the north face of Everest, that next simulation is simply a matter of having atom codes in your PDB file standardized. And, speaking of PDBs, article #50 has the added bonus of having its own entry in the Protein Databank as 2NA5 – quite a treat (to me, anyway). And furthermore, this is the first of my publications to benefit from the Research Computing infrastructure on the Syracuse University campus – the throughput of calculations for future work is completely unprecedented in my history of resource access anywhere (the drop in storage prices is very real to some of us). Authors: Henry K.E., Kerwood D.J., Allis D.G., Workinger J.L., Bonaccorso R.L., Holz G.G., Roth C.L., Zubieta J., and Doyle R.P. Abstract: Vitamin B12-peptide conjugates have considerable therapeutic potential through improved pharmacokinetic and/or pharmacodynamic properties imparted on the peptide upon covalent attachment to vitamin B12 (B12). There remains a lack of structural studies investigating the effects of B12 conjugation on peptide secondary structure. Determining the solution structure of a B12-peptide conjugate or conjugates and measuring functions of the conjugate(s) at the target peptide receptor may offer considerable insight concerning the future design of fully optimized conjugates. 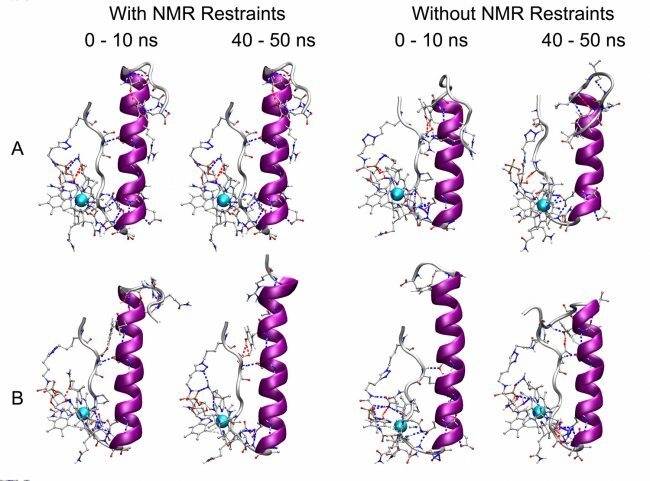 This methodology is especially useful in tandem with constrained molecular dynamics (MD) studies, such that predictions may be made about conjugates not yet synthesized. Focusing on two B12 conjugates of the anorectic peptide PYY(3-36), one of which was previously demonstrated to have improved food intake reduction compared with PYY(3-36), we performed NMR structural analyses and used the information to conduct MD simulations. The study provides rare structural insight into vitamin B12 conjugates and validates the fact that B12 can be conjugated to a peptide without markedly affecting peptide secondary structure. Published in MedChemComm (direct link: xlink.rsc.org/?doi=C2MD20040F). And Happy Belated New Year. 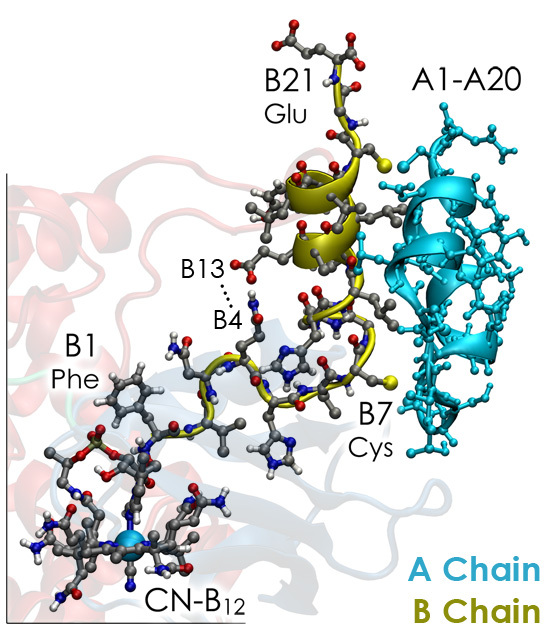 After the methodological work that went into the Molecular Biosystems paper, this was a remarkably simple molecular dynamics study of the changes to vitamin B12 binding in transcobalamin II (TCII) with the B12 conjugated to the first amino acid side chain in the B-Chain of insulin. The structure of the B12-insulin conjugate is shown below in a molecular dynamics snapshot, which reveals that the binding of B12 to its TCII transport protein is negligibly affected. And apparently the experiments went well, too. Cover hopefully to follow. Abstract: The practical use of the vitamin B12 uptake pathway to orally deliver peptides and proteins is much debated. To understand the full potential of the pathway however, a deeper understanding of the impact B12 conjugation has on peptides and proteins is needed. We previously reported an orally active B12 based insulin conjugate attached at LysB29 with hypoglycaemic properties in STZ diabetic rats. We are exploring an alternative attachment for B12 on insulin in an attempt to determine the effect B12 has on the protein biological activity. We describe herein the synthesis, characterization, and purification of a new B12-insulin conjugate, which is attached between the B12 ribose hydroxyl group and insulin PheB1. The hypoglycemic properties resulting from oral administration (gavage) of such a conjugate in STZ diabetic rats was similar to that noted in a conjugate covalently linked at insulin LysB2911, demonstrating the availability of both position on insulin for B12 attachment. A possible rationale for this result is put forward from MD simulations. We also conclude that there is a dose dependent response that can be observed for B12-insulin conjugates, with doses of conjugate greater than 10-9 M necessary to observe even low levels of glucose drop.